Pilgrims across Europe have been taking to the roads to Santiago for many centuries. As pilgrims traditionally started their journey from their own homes, various Camino routes developed over time, including many coming from different parts of France, the ‘Chemins de Compostelle’. Of the Camino routes in France, the Le Puy Camino, also known as the Via Podiensis or Le Puy Way, is one of the most popular with modern pilgrims. This wasn’t always the case, and it seems back in medieval times other routes such as Vezelay, Arles and the Camino from Paris/Tours attracted more pilgrims. The Le Puy Camino route is one of the four main routes from France mentioned by Aymeric Picaud in the Camino’s first ever ‘guidebook’, the 12th century Codex Calixtinus. One of the high profile medieval pilgrims to Santiago was Godescalc, Bishop of Le Puy; who went on pilgrimage to Santiago in the 10th century; and is said to have inspired many other French pilgrims to do the same. The town of Le Puy en Velay has been a pilgrimage destination since the Middle Ages, since pilgrims from far and wide would travel to the town to visit the 11th century Notre-Dame du Puy Cathedral. 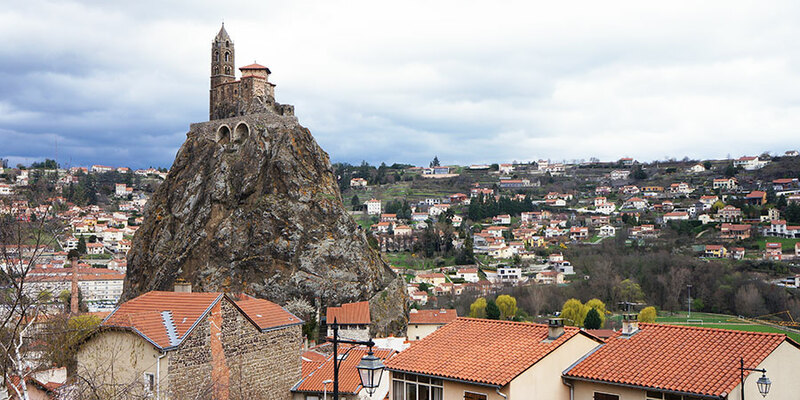 The volcanic peaks of Le Puy en Velay rising from the valley, are quite a sight. It is easy to imagine medieval pilgrims making their way up the winding little cobbled streets to pay tribute to the Virgin of Le Puy. Today’s pilgrims can get an additional thrill from walking all the way up to the head of the Notre Dame de France statue, at the very top of the hill. From here you will get the greatest panoramic views of Le Puy en Velay and the surrounding valley. Another iconic peak in Le Puy is the Rocher St Michel, where you can walk up the 268 steps to the chapel of Saint Michel d’Aiguilhe (known ad the needle), built by Bishop Godescalc after returning from his pilgrimage to Santiago. Place du Plot in the historic town is the traditional gathering point for pilgrims starting the Le Puy Camino, before setting off, heading out of town along the aptly named Rue St Jacques. *Le Puy en Velay is the starting point of the Le Puy Camino route. The uplands of the Aubrac Plateau reward pilgrims on the Le Puy route with glorious open landscapes and fantastic wilderness. The hamlet of Dormerie d’Aubrac has an interesting story: legend has it that a Flemish pilgrim named Adalard, founded the village back in the 12th century to offer shelter and protection to fellow pilgrims on the way to Santiago, as a thank you for returning safely from his Camino journey. Pilgrimage in medieval times was a dangerous business! 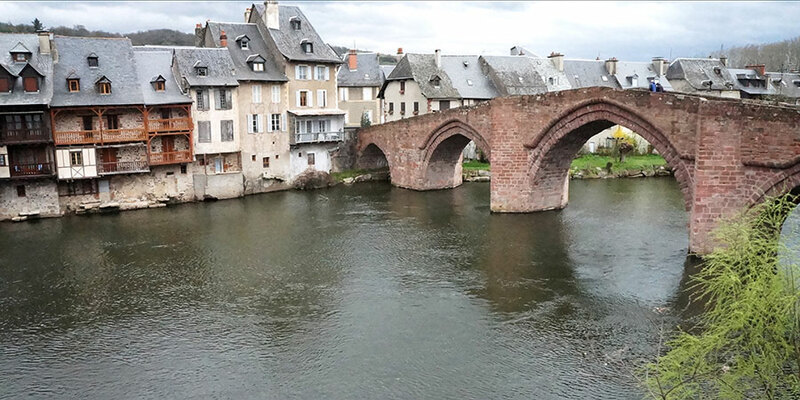 The Le Puy Camino takes in very picturesque towns along the valley of the Lot River in the Aveyron department, such as Saint Come d’Olt with its quaint arched alleys and medieval charm; Espalion with its pretty riverfront and medieval bridge and Estaing, home to an imposing 15th century castle. They are officially among the ‘most beautiful villages in France’ (Les Plus Beaux Villages is actually a title awarded to French towns to acknowledge their heritage, history and natural beauty). You will notice street names in this area are in both French and Occitan. *You will find the Lot Valley on the section of the Le Puy Way from Aubrac to Conques. Surrounded by lush forests and magnificent mountains views, Conques is definitely the one place you should not to miss on the Le Puy Camino. There is something really special about this picture-perfect village. Its medieval character has been preserved nearly intact, and as you wander the little narrow streets lined by timbered houses, it is no surprise you will feel as if you are stepping back in time. 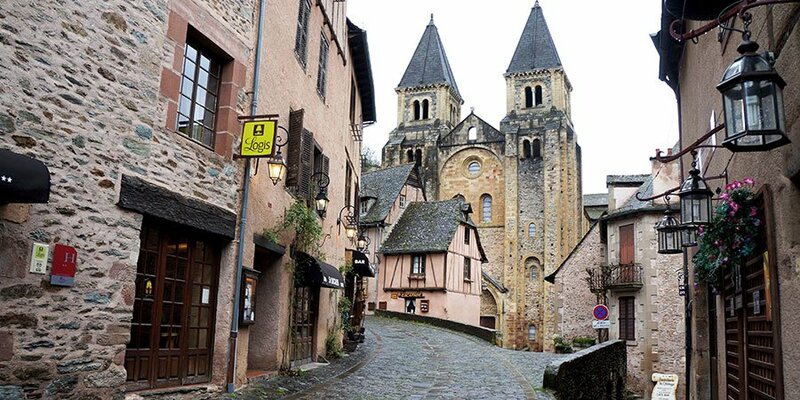 The 10th century Sainte Foy Cathedral has made Conques an important destination for pilgrims since medieval times. It is believed the relics of Sainte Foy, a young woman martyred in the 4th century, have the powers to cure eye ailments and even blindness. And did you know the name Conques means ‘shell’? The Lot River wraps around the friendly city of Cahors in a soft embrace. 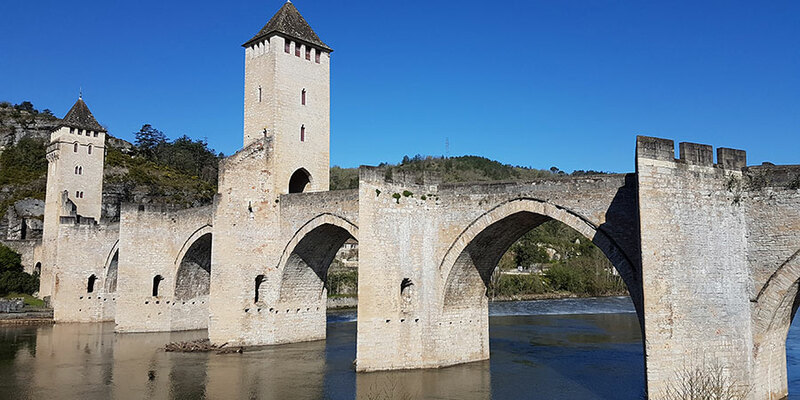 Cahors is another highlight on the Le Puy Camino route and it is here you will cross the most impressive bridge you will encounter on the whole way to Santiago: the magnificent Pont Valentré, built in the 14th century as a fortified bridge with six arches and three bridge towers. There is plenty to like about Cahors, apart from its most iconic bridge: the Boulevard Leon Gambetta with its neoclassic buildings in soft pastel colours divides the new part of the city from the old medieval quarter, a maze of little alleys, half-timbered buildings and pretty squares. 7th century Saint Pierre Abbey in the town of Moissac is home to one of the most impressive cloisters along the route, and we highly recommend a visit. 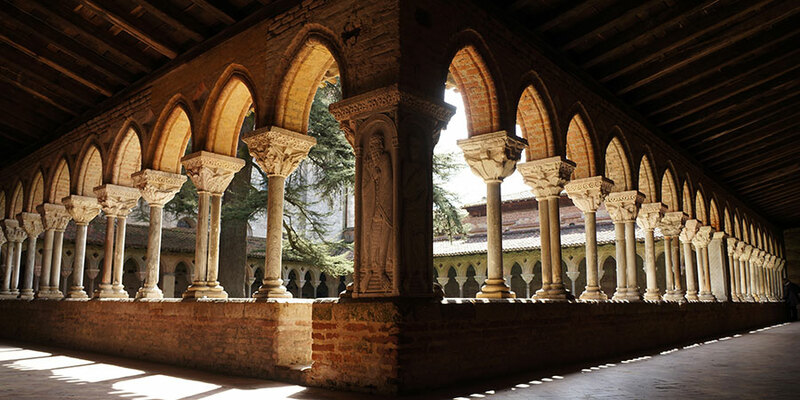 Dating back to the 11th century, the cloister, masterly sculpted is a unique piece of Romanesque art. Each of the corners feature one of the apostles, including, of course St James. The Le Puy Camino from Le Puy en Velay to St Jean Pied de Port is over 700kms long; and once in St Jean you can join the French Way. Only another 800kms to go to reach Santiago! The route is well marked, as a GR65 trail and also with the yellow scallop shells of St James. At CaminoWays.com we have the Le Puy Camino divided in 6 sections of approximately a week. The whole route can be completed in just over a month, see here: Le Puy Way. Many choose to do a section or two each year. If you are looking for the most scenic regions, we would recommend sections 1, 2 and 3. Why go: it is the most popular of the Camino routes in France and you will encounter many pilgrims on the route. Exact figures are hard to come by but it is estimated 10,000 people started their Camino from Le Puy in 2008 (source: Cicerone guides). With an increasing popularity of the Camino in recent years, this number is likely to be much higher today. 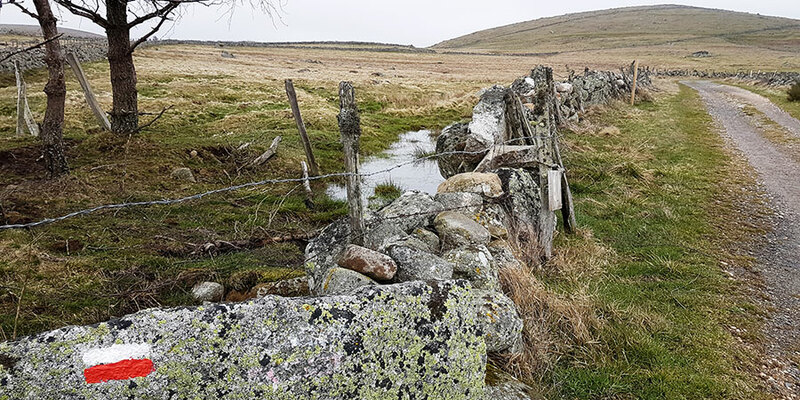 When to go: the higher regions such as Aubrac and the Pyrenees will get snow in the winter months (some times as late as April) so we recommend you travel from late Spring to get the best possible conditions. My wife and I are interested in doing a walk and we would like more information about the different options and costs. Perhaps you have some brochures you could mail us. Or you could send us the information using our internet. We are interested to do the Camino from Le Puy to Santiago. How long does it take normally in days? Kilometers? Thank you christo nel, it is a wonderful route, definitely another one for the bucket list! I’ve done other Camino routes and love it. The Le Puy route promises so much so perhaps that will be one for the near future.